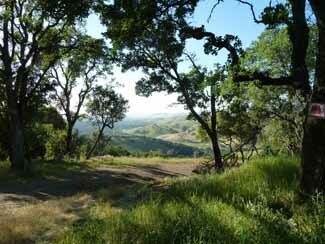 As usual, tl:dr. Executive Summary: We did a NATRC at Mt Diablo, which was really tough. 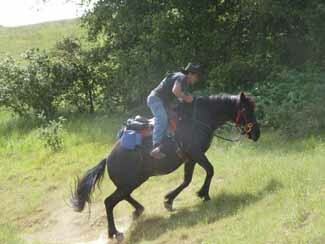 We rode with a friend who was taking a horse on his first NATRC, so Sunny successfully led for the entire 23 mile ride. The ride was gorgeous and very well marked and the company was good, so we had a great time. 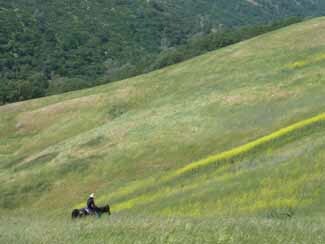 A couple of weeks ago (May 7, I think), Sunny and I did the NATRC Region 1, 2011 season-opening ride. 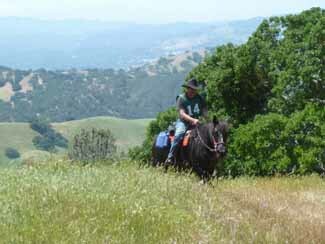 The CMDTRA (Concord-Mt Diablo Trail Riding Association) put on the ride, and it was based at their facility near Clayton, on the east side of Mt. Diablo. I'd heard that it was a tough ride, and having ridden my bike at Mt Diablo, I believed it, so we were mentally, at least, prepared for anything. It turned out to be a challenging, but beautiful ride with, as usual, superb company. Here's the story. We had an uneventful drive up from Santa Cruz, then wended our way through Walnut Creek to the CMDTRA headquarters - what a place! Camping, with paddocks. A pool. A round pen. Two arenas. Access to amazing trails. A clubhouse. With kitchen. With showers. With BAR and an incredible view!!! The rider manager gave a quick history of CMDTRA: it was started in the mid-1950's by some local trail riders, who started one of the first NATRC rides ever in the 60's, and the ride has gone on continuously since then. 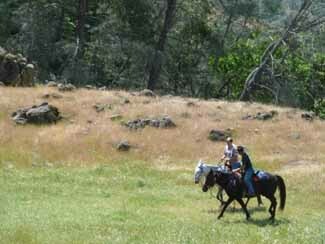 In any case, it's one of the finest trail horse venues I've seen or heard about. 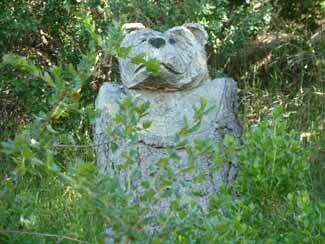 I forgot to ask about its origins and history, but he definitely added character to the place. When we got back from our walk, I started hunting for someone to ride with. Fortunately, my salvation had camped next to us: Joe and Michelle Pimentel. Michelle had guided Sunny and me through our first NATRC ride, so I thought maybe I could talk her into dragging us around again. It turned out that she was riding Open class (faster and longer than Novice, which is what we do), but Joe, a very experienced NATRC rider, was taking a new horse, Codie, on his first NATRC ride and was looking for an experienced lead horse. I swallowed hard and allowed as to how Sunny and I would be happy to give it a try. So that was settled. Next we went to the ride meeting, where we got our maps, etc. (I will say here that the trails were wonderfully marked - I don't think I *could* have gotten lost, even if I had ridden alone.) Also, we got warned that it was Spring time, which means baby wild pigs, turkeys, and rattlesnakes at Mt. Diablo. And they warned us about Mercury Pond - not to let our horses drink, since it was poisonous. Sheesh. Things to look forward to, for sure. The bugle sounded at 6 AM, and we got ready and headed for the start. Joe and Codie were already there and Codie was primed for action. Codie is a big fella, and looked sort of draft-like to me - an impressive sight when rearing and dancing in place! Joe is police officer and is usually pretty poker-faced, but by the time the Open and Competitive Pleasure classes had left (in NATRC, they send the faster/longer classes out first), Joe was looking pretty tight-jawed, what with Codie's clear need to move, immediately and fast. Shoot, *I* was tight-jawed, thinking about riding in front of them! Finally, the Novices were started, and we went first. In NATRC, the riders are clocked out at 30 second intervals, and on this ride, we had about a block of riding on a road, then we turned onto a pretty narrow singletrack - where we all bunched up together. There was no place to pass, so we had to keep our horses rated. We were doing well until the first (of about 15) water crossing: the group of four horses in front of us was having trouble getting across, so we had to pull up at a distance and watch them work their way across. I figured it was do or die for us - and it turned out to be a definite "do". Sunny and Codie were both interested, but only academically - they made no moves to go down and join the fun. And when the people in front of us finally made it across, both of our horses stepped calmly through and kept on going. By the way, with a few short exceptions, as Joe predicted, as long as Codie was moving, he was a good citizen. Shortly after that, we emerged into the open on the side of Mt Diablo, where we stayed for pretty much the rest of the day. In the picture, you can see the clouds and fog, but you can't see the wind. It was supposed to be in the mid-70's and I didn't want to carry a bunch of clothing around with me, so I took off in short sleeves - and it was *freezing*, with the wind in the 20+ mph range all day. Sheesh. Our first obstacle was the Mercury Pond, so called because of the mercury in it, left over from the mining operations at Mt. Diablo. It was about 10 yards across and a really funny color and smell. Sunny, who's usually pretty good about crossing water, danced around it, staying on its edges. I was expecting something similar or worse from Codie, but I turned around and saw him marching right through the big middle of the pond. Horses. Right after that, we had our first P&R. Sunny and Codie both did well, but I was so cold that my legs were shaking and I didn't think I could get back on! We wandered around in the park for a few miles, then came on our second judged obstacle. We were asked to leave the trail and go up the side of this hill and around a tree. We could choose the route. Sunny went up about a foot then back into the trail, then I re-pointed her and she went up willingly and came down thoughtfully - perfect on the second try. I figured that first time, she was just checking to see if I was serious; in Santa Cruz, we'd probably be arrested for leaving the trail! Joe and Codie had a more exciting time. Codie went where Joe pointed him, but really, really fast. Joe got him to stop and consider at the tree, then brought him back down to the trail in good order - but it was exciting. 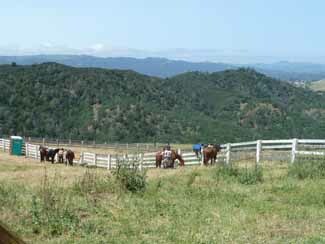 After the hill, we had to trot out for the vet, who was from a NATRC region back east, where there are a lot of gaited horses. When Joe "trotted" Codie, he broke into this weird gait. The vet was all over that immediately - evidently, Codie is probably mostly Tennessee Walker - according to the vet, he looks like it and he gaits like it. We lost about 10 minutes to the gaited horse discussion; it turns out that there are registries for horses who gait, whether or not their pedigree is known. Which I think is wonderful: the horses are associated together for their proven ability to do something not all horses can do, not because of their parents. Anyhow, Joe was pretty excited about the information, and I thought it was really interesting. Shortly after that, we hit the lunch stop, which was at someone's ranch. It was great. Ride management had brought out hay and water for the horses, and bathrooms and lunch bags for us, so took advantage of the "conveniences" and ate with our horses. After our 45 minute hold, we took off, after another vet check. There weren't as many wild flowers as I had imagined there would be, although there were some yellow flowers in evidence as we left lunch. Also, at this point, we heard some turkeys, but they were far off the trail, and neither horse seemed to care. For the record, we did *not* see any baby pigs or snakes. The only surprising animals we saw were a bunch of huge black and yellow butterflies that kept flying into us while we were walking along one creek bed. 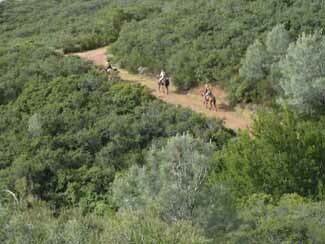 One of the well-planned things about the ride was that the Open riders did several short additions to the trail, rather than one big added loop, to make their required additional distance. This had the effect of periodically re-uniting the Novice riders and the Open riders through the course of the ride. At about 5 miles after lunch, we ran into Philip, Joe and Michelle's son, who was riding Marilyn the Mule in the Open division. By that time, Marilyn and Philip were both looking for someone to ride with, so they joined us. I was really impressed with Sunny - the last time she'd been that close to a mule, at last year's Banana Slug Trail Trials, she'd almost had a heart attack. Either she's gotten more blase or, at 17 miles in, she didn't have the energy to care. The ride continued to be either up or down - no flat stuff. At this point, also we started running into hikers, which meant that we were getting close to a parking lot. Just as we got through the parking lot, there was a little sign that said "Trot Your Horse to the P & R". So we did. Sunny was great - there was a horse in front of her, but I was able to rate her and kept at a constant distance. Codie was also remarkably well-behaved and stayed off Sunny's rear, even though this was the fastest we'd gone all day. And that was good because there was a judge sitting in one of the trees, taking note. After that, it was just an endless three miles to the end. We could see the parking lot from about a mile out - but we were so high above it that it took forever to actually get in. When we finally arrived - 23 miles total distance - I cleaned Sunny up and vetted her out. I set her up on her Tilt-Tie with a couple of hay bags and some beet pulp and went to dinner. Dinner was great and, more unexpected, the raffle was incredible. There are always raffles at NATRC rides, to raise money for scholarships, ride entries for juniors, etc. The prizes are usually sort of symbolic of winning, rather than anything you'd actually want: inexpensive brushes, t-shirts from previous-year rides, spray bottles - stuff like that. This raffle was unreal. 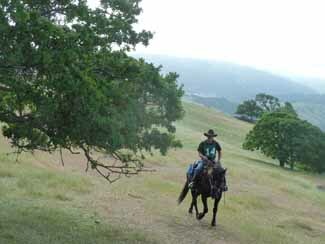 The top prize was a beautiful, new, quarter horse tree, Western Saddle with breast collar. There were several leather head stalls, some saddle pads, leather care kits, bottles of wine, riding vests - you name it. According to report, that's the way the raffle always is at this particular ride. Next year, I intend to mortgage the house to buy more raffle tickets! By the time dinner and awards were over, the wind was really blowing, so Sunny and I had a more eventful trip home than we had hoped, but other than that, it was a perfect ride. Oh yeah, Sunny won Best Novice Lightweight Horse.